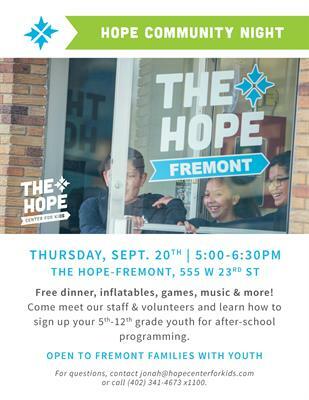 Join The Hope-Fremont for free dinner, inflatables, games, music & more! Come meet the staff & learn how to sign up your 5th-12th grade youth for after-school programming. Open to Fremont families with youth. Thursday, September 20 from 5-6:30 p.m.